조선 중기 때의 문인인 김흠조(1461∼1528)의 무덤에서 출토된 일괄 유물이다. 김흠조의 자는 경숙(敬叔), 호는 악금당(樂琴堂)이며 의성 김씨 17대손이다. 연산군 때 문과에 급제하여 충주·상주·제주목사 등 지방 수령직과 중종 때 장예원 판결사를 역임한 인물로 숙부인 정씨와의 사이에 4남 1녀를 두었다. 이 유물들은 1997년 3월 영주∼평은간 국도공사를 위한 분묘 이장 중에 발견되었는데, 3종 134점의 일괄 유물로 복식류 7종 66점, 문서류 2종 38점, 기타유물 4종 30점이다. 복식류는 옷깃이 둥근형태의 옷인 단령 7점, 옷깃이 곧은 형태의 옷인 직령 2점, 직령과 비슷하나 소매가 짧은 형태의 옷인 답호 11점, 웃옷에 치마가 연결된 형태의 옷인 철릭 12점, 바지류 8점, 상의류 6점, 염습구 20점이다. 문서류는 죽은 사람을 애도하여 지은 글인 만사(輓詞) 19점, 제문 19점이다. 내용은 주로 김흠조의 이력과 학덕, 선행 등에 대한 칭송과 친분관계를 표현하고, 글을 지은 사람의 직함과 이름을 적었다. 기타유물은 분청사기인화문항아리·백자병·백자소형단지·백자뚜껑·백자완 등 사기류와 동경·철제가위와 같은 금속제품, 유리제장신구, 목관, 마제자리 등이다. 출토유물 중 복식류는 아직 학계에 보고된 바 없는 새로운 형태의 것으로 조선시대 복식사와 상·장례 풍속사 연구에 매우 귀중한 자료이다. 또한 문서류는 당시의 장례제도 연구에 큰 도움이 될 뿐만 아니라 문인들의 행적을 파악하는 사료로서 중요한 가치가 있으며, 기타류 30점은 조선시대 지방관료의 부장품 연구에 귀중한 자료로 평가된다. Kim Heum-jo (1461-1528, childhood name: Gyeong-suk, pen-name: Akgeumdang) was a 17th-generation descendant of the Uiseong Kim Clan. He passed the higher civil service examination during the reign of King Yeonsangun (r. 1494-1506) and served as Magistrate of Chungju, Sangju and Jeju. During the reign of King Jungjong (r. 1506-1544), he served as a judge at the Jangyewon (Office of Slave Registry). He fathered four sons and one daughter by his wife, Lady Jeong. 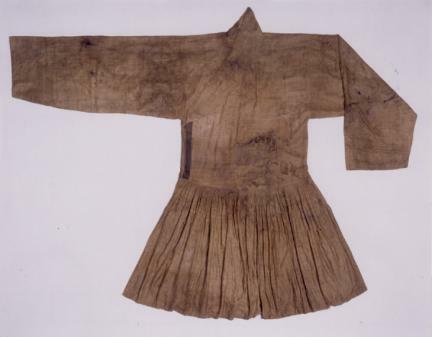 In March 1997 some 134 artifacts were excavated from the tomb of Kim and his wife - including sixty-six articles of clothing in seven kinds; thirty-eight documents in two kinds; and thirty other items in four different kinds - when the tomb was moved for the construction of a national road between Yeongju and Pyeongeun. Among the garments are seven dallyeong (courtier’s ceremonial robe), two jingnyeong (men’s coat with straight collar), eleven dapho (coat with a straight collar and short sleeves), twelve cheollik (military officer’s coats pleated at the waist), eight pairs of trousers, six jackets, and twenty items used to dress the corpse. The documents include nineteen pieces of elegiac verse and nineteen funeral addresses written for Kim. They express the writers’ relationships with Kim and praise his academic and career achievements and virtuous deeds. Each piece carries the writer’s name and official title. The other relics are ceramic objects including a buncheong jar with stamped design, a white porcelain bottle, a small white porcelain jar, a white porcelain lid and bowl; metal objects including a bronze mirror and iron scissors; glass accessories, and a wooden coffin and hemp mat. The garments are in styles previously not reported in the academic community. They are important materials for study of the history of dress and the funeral customs of the Joseon Dynasty (1392-1910). The documents are also useful for understanding the funeral system as well as the activities of literary figures at the time. The remaining thirty miscellaneous items are also valuable sources for studying funerary gifts presented to local officials during the Joseon Dynasty.